Well, I finally got through all the news after a week in New Mexico with my family. No injury prediction reports (PAIN or HURT) today, but will look at publishing them on Thursday (if not before). From these case studies, I suspect that hitters who tend to flatten out the bottom hand early and keep it flat through contact put greater strain on their wrist joints. This forces them to use more of their bones and ligaments to stabilize their swings, rather than their muscle mass. Muscles can be strengthened, while bones and other connective tissue cannot. Just like pitchers who are suffering from diminished velocity due to developing elbow instability, I expect hitters with this type of movement pattern to be more likely to suffer downturns in productivity. • Nolan Ryan and Rick Honeycutt think raising the pitching mound will decrease Tommy John surgeries. Honeycutt’s belief is that the steeper the grade of the mound, the more stretched out a pitcher becomes before his foot hits the ground, and the more of the impact of throwing a pitch is absorbed by the lower body. With a limited grade, the contract between foot and mound comes quicker, and the shoulder area assums the brunt of the impact of the release of a baseball. In my opinion, it just sounds like to old farts talking about the good old days. • Lucas Giolito talks about the cause of his Tommy John surgery. • Some other minor leaguers talk about when their UCL tore. Binford remembered back five years ago, when he was a 10th grader pitching for the Mercersburg Academy in Pennsylvania. Up to the plate walked some stud on the other team who was good enough to attract 10-20 scouts. • Bob Cohn of the Trib looked at the rise of oblique injuries and gives the following information. This season, 24 players have gone on the DL with oblique and related injuries through Friday. Before 2011, the most in any season was 29 during a 20-year time period studied by Los Angeles Dodgers trainer and medical director Stan Conte. In the past three seasons, Conte said, the totals were 50, 45 and 41. When Conte latched on to the issue in 2011, he said he was inspired by “a bunch of name-brand players who were going down (with oblique injuries), and people asking questions we didn’t have answers for.” Assisted by several orthopedists, he started researching the type, frequency and possible causes of abdominal injuries that sent players to the DL. Conte compiled lots of data. Three years later, answers remain elusive. OK, let me run Stan’s numbers (who I completely trust) against mine. Note: Conte’s numbers include all abdominal injuries, so I will also. 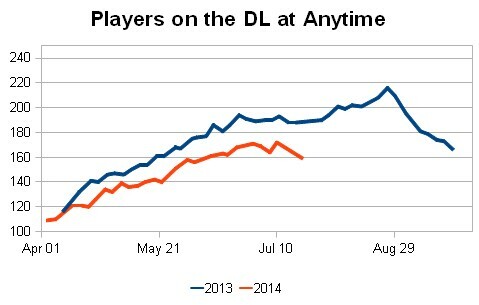 The numbers are a bit different, but the trend is the same with a decent spike over the past three seasons. One issue is the overall number of DL stints have also been increasing over past three seasons. Non-core DL stints have gone from an average of 406 per season from 2002 to 2010 to 449 from 2011 to 2013 or a 11% increase. The core injuries have gone from 34 per season to 52 per season or a 53% increase. A fair significant jump compared to the overall injury rate. Additionally, switch-hitters may have more core injuries. Conte said switch-hitters might be especially susceptible because they have two different swings. Walker, a switch hitter, was batting left-handed when he swung against Cubs righty Edwin Jackson last July at Wrigley Field. I will totally disagree with Conte here. It seems switch-hitters are less likely to have abdominal injures. 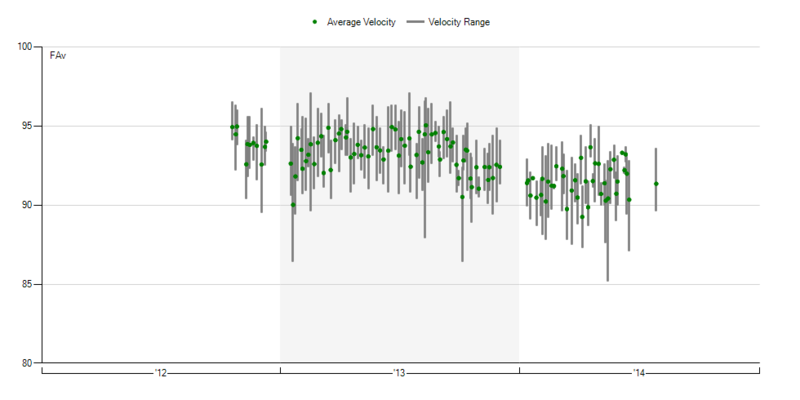 Of the position players with the injury over the whole time frame, 7.3% were switch hitters. Over the same time frame, 14.9% of the PA went to switch-hitters (and 14.7% of the players with any PA were switch-hitters). Switch-hitters historically are less than half as likely to have an abdominal injury. • MLB Radio did a two hour show on Tommy John surgeries this past week. Here is a link to the audio highlights. • Matt Cain’s “elbow has been cranky at times going back to spring training.” The injury is a nice excuse from season long struggles. And he just goes on the DL. • Cliff Lee returns to start for the Phillies tonight. I don’t like starting him in daily lineup leagues today. He was out with an arm issue. It took over 2 months to return. He didn’t dominate his rehab starts in A ball. He is stubborn and didn’t even want to pitch in the rehab games. I think he is coming back too early. I would wait to see where his velocity stands and if he can hit his spots. • Miguel Cabrera is probably still dealing with a lingering injury. When Cabrera said last week that he wasn’t going to take part in the Home Run Derby, he said it was about his swing, that he didn’t want to mess it up anymore. Go all the way back to the second week of the season, and Cabrera said he felt good but that his swing wasn’t right. Cabrera wasn’t keen on using injuries as an excuse down the stretch last year, either. So Cabrera saying he’s good doesn’t mean he’s healthy. He is a big guy and on the wrong side of 30. It shouldn’t be a surprise he is hurt and producing less. • Josh Beckett plans on returning Tuesday to pitch. If you want to start him, read the following and make your own choice. The Dodgers expect to have Josh Beckett back on the mound Tuesday, but the right-hander could be battling a hip injury for the remainder of the season. Beckett was forced to exit his July 6 start after five scoreless innings when he felt a twinge in his left hip while running the bases. An MRI showed hip impingement, but Beckett revealed Saturday that the diagnosis is a torn labrum with two cysts. My choice is simple, stay away at least for a few starts. • Evan Gattis is supposed to be activated by the Braves today. • Josh Reddick is scheduled to come off the DL tomorrow. • Doug Fister doesn’t like the new protective caps. 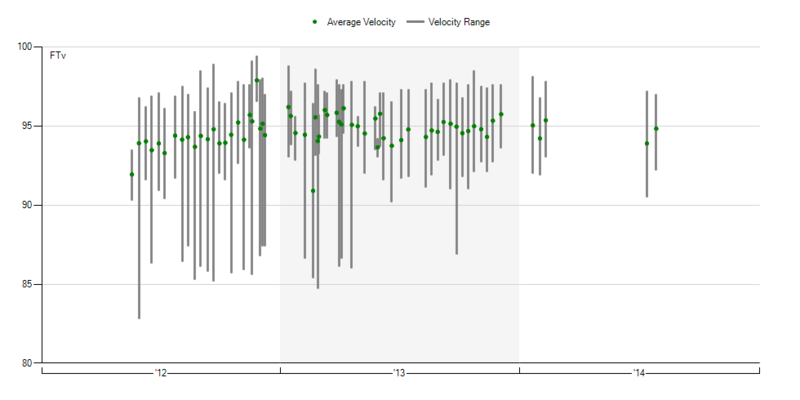 • Francisco Liriano’s fastball speed is back up to his 2013 levels. 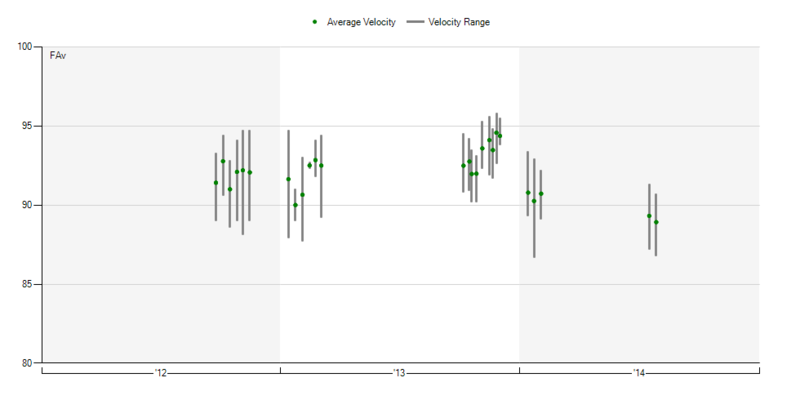 • Brett Anderson’s velo is at his lowest level over the past three seasons. Could he still be hurt? • Joe Kelly’s is fine. • A.J. 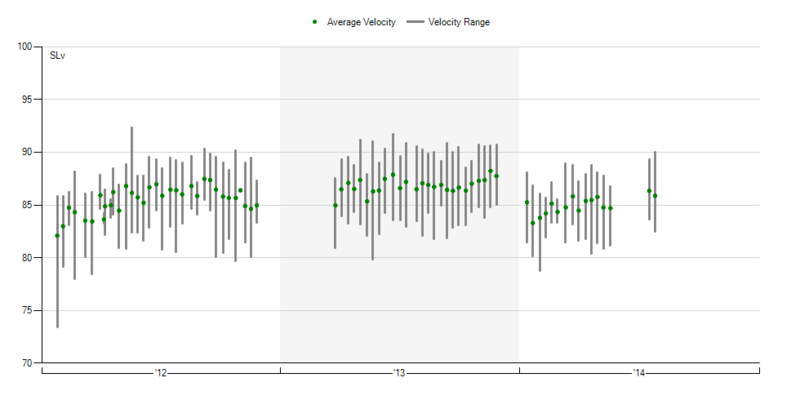 Ramos’s velocity is the same as 2014, but down from 2013. (****) Free Agent Red colored entries are updates since last report. We hoped you liked reading MASH Report (7/21/14) by Jeff Zimmerman! Don’t Ryan and Honeycutt think RAISING, not lowering, the mound will decrease Tommy John surgeries? Or am I misunderstanding them?